The dark realms of Ruin Mist have many inhabitants, including dwarves, goblins, gnomes, elves, trolls, and wolmerrelle. Dwarves dwell in many areas of Under-Earth. 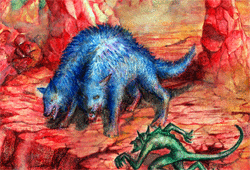 They are friends to the dark elves and loath the forest elves, which are aligned with the Gnomec Dwarves. 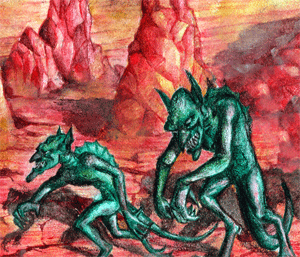 They are highly regarded for their prowess in battle and their ability to mine ore from deep within the earth. Gnomec Dwarves, sometimes referred to as gnomes, are an ancient line of dwarves whose ancestors once had great powers of divining and magic. Magic in dwarves is rare and was regarded suspiciously by other dwarves until the Rhylle/Armore wars, when the gnomes were driven out of the known lands. The dark elves of Under-Earth control Greye. 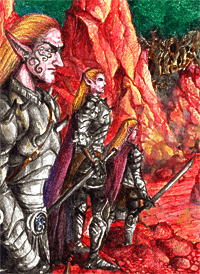 Their gray skin, dark hair and pointed ears are unmistakable. Since the fall of the three kings, the dark elves lands are organized into fiefdoms, loosely allied to the old kingdoms. Swamp trolls live in swamps and unlike their cousins, they are quite civilized. While they prefer to live in mud-built homes on the edge of swamps, many have ventured into the lowland plain areas of Under-Earth. Wood trolls are nasty creatures who hunt in packs and live primarily in trees. They are ugly, smelly creatures and the strike of their claws can be deadly. Wolmerrelle are shape changers, the half animal and half human race that worship Arr. Wolmerrelle are known to have 2, 3 or even 4 heads. The strongest, those linked most directly to their human past, have a single head and they are the largest of the Wolmerrelle in body size. 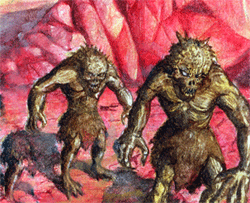 There are several crossings of the races as well, including a race of half trolls and half giants known as troants.